Here is a take on making a rug from recycled T-shirts. If you have basic crochet skills, and access to old t-shirts, you are set. This is a perfect project for curling up by the fire for a night of cozy creating! Go see One Dog Woof for the how to. Want more T-shirt crafts? There is a 50+ for that! Today I am sharing with you a dear friend’s weight loss victory (and the failures that preceeded it). This is not the typical crafty post you find here at SBLC, but it is something I believe in and have witnessed firsthand. Not only that, but it is an important topic on the minds of millions as New Year’s diet resolutions are being made for 2013. I am the first to roll my eyes and change the channel when I hear weight loss miracle commercials, and if you ever told me I would be posting about one of those plans, I would have thought you were nuts. Watching someone I am close to try everything under the sun to no avail, then find a healthy approach that works has made me a believer. We met in 2006 and became workout buddies right away. Over the years, I have watched this woman eat like a rabbit, try this diet plan and that, run everyday, and not lose a pound. Or lose a pound and gain 4 back, while still on the diet and exercise plan, feeling exhausted all the time. We have trained for and run a half marathon together, done group classes and gym workouts regularly, all the while Ursula sharing with me her frustration with her metabolism, stubborn weight and high cholesterol. I moved away, so haven’t been in regular contact with Ursula for the past 2 years. Imagine my delight when she recently told me she had lost 30 lbs over 3 months. I couldn’t believe it. Not only that but she feels great and has seen a huge improvement in her cholesterol levels. She did this with Take Shape For Life, which you can read all about by clicking the link. I asked her what made this approach so doable, and she said “it’s just easy.” No counting of anything, no going hungry or exercising obsessively – but instead a healthy, effective, sustainable way of life. Ursula’s father visited from Germany, and as soon as he saw her at the airport, he wanted to do what she did. He started TSFL, dropped 12 lbs in two weeks, and ordered meals for he and his girlfriend back home! If weight loss was on my resolution list this year, I would be giving Take Shape For Life a go. I have been a busy girl, playing with spray inks, stamps and my new printer (which I scored over the holiday for a steal)! As a result, here are a couple of free printables for you to enjoy! This is a watercolor paper sprayed with Dylusions for the background, stamped with inkadinkado Insect Amalgam cling stamp, and touched up with white gel pin and black Pitt pen for depth. Just right click the link under the thumbnails to pull up the full res file and save it to your computer or print. I also included just a watercolor background for you to play with in Photoshop. ***UPDATE: After much research on printers for mixed media art, I landed on the Epson Artisan 837, and am loving it! Gorgeous scans, prints, wireless, vibrant, perfect so far. Alter these any way you want. Please do not sell or redistribute as your own, but instead, direct people here for the files! New Year’s Resolution time always makes me pause and reflect. I realized I have put off some things I have wanted to do for awhile, and have decided to aim for more balance (same resolution every year… balance). I am going to draw/art journal everyday in 2013, even if only for a minute. Here is a piece I did this week for a Christmas gift. I used bristol smooth paper, papermate flair pen for the outline in black, and prismacolor markers for the coloring. Super fun. Doodling is addictive. I took a cool class for $25 called A Whole New Doodle from Stephanie Ackerman, and it has my pen moving. It is kinda meditative, and perfect for this blizzard that hit today. Plenty of time for artwork! What are you working on these days? New Year’s resolutions? This mixed media Christmas verse piece is made from recycled pallet wood, crepe paper circles, old sheet music, a wood tree, and upcycled soda can star. It is so fun and challenging to see what you can come up with from what you have in your stash. With creative layering of paint, paper and ink, the possibilities are endless. The “canvas” for my background came from this chevron pumpkin piece I showed you in the fall. It is composed of pallet wood. I wanted to update it to Christmas, and decided to cover the chevron with a festive, snowy background for my tree. The inspiration for this piece came from Claudine Hellmuth’s holiday layers card over at Ranger.com. To start, I painted on a layer of Gesso. I didn’t really care if the chevron peaked through, so I just did one layer. Wben that dried, I used red fluid acrylic paint to lightly cover the gesso. It is ok to leave parts white. Not going for perfect here. When the red paint was dry, I added pieces of torn sheet music to the bottom to form a hill shape. Apply matte gel (or Mod Podge) to paper and adhere to canvas. Once in place, cover with layer of matte gel. I stamped aqua acrylic paint randomly. Once I was happy with the background, I painted on a thin layer of matte gel and let dry. I used my sizzix Assymetric rings die to cut rings and circles from white crepe paper and adhered them onto the layered background to create snow. When I had all the rings I wanted, I touched them up here and there with white acrylic paint, then coated the entire piece with matte gel and let dry. When that dried, I painted a blue scalloped edge at the bottom, outlined it with black Pitt artist pen and covered the entire piece with one more layer of matte medium. To create the tree, I painted green acrylic paint and doodled the verse with pencil first. I went over the text with Pitt artist pen. There will be a tutorial on how to do this in the future. 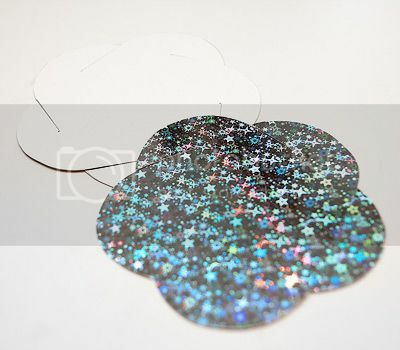 I adhered the completed tree with permanent glue dots. The star was made with Sizzix 3D star die from a coke can. I dipped it in Mod Podge and sprinkled glitter on and let dry. Adhered it to tree with permanent glue dot. I am a little bit in love with it. It may be the last transformation of the pallet canvas. It is ok. There are more pallet pieces in my garage just waiting to be pieced together for the next piece. Mason jar crafts have stolen hearts everywhere. It is an epidemic. That is why when I saw this wrought iron chandelier at a garage sale for $2, I immediately pictured mason jars where the hurricane glass would be. I showed you how I attached the removable jars in this mason jar repurpose chandelier tutorial. The fact that the jars are easily unscrewed from the base makes it simple for me to change the color theme with the seasons. I went at them with red glitter glass paint from DecoArt, and I loves loves loves them. Remember the fall and rainbow versions? Speaking of Mason Jar Decor Ideas, here are over 60 more! Have the merriest of Christmases, my awesome readers! 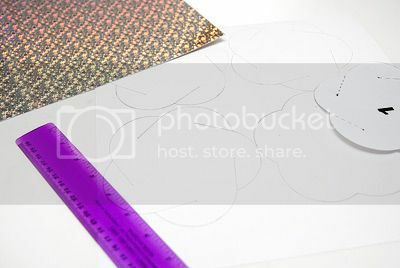 I have a great placeholder DIY tutorial for you today using just a few supplies. These can be created in no time, and are perfect for holiday and party table settings, as well as photo or holiday greeting card display. Change the add-ons to accommodate any occasion! Add a meaningful photo and give as a gift that will be cherished. The base wire holder is super easy to make, and embellishing possibilities are limitless. Cut 10 inch segments of wire and wrap around mandrel or other round tube at one end. 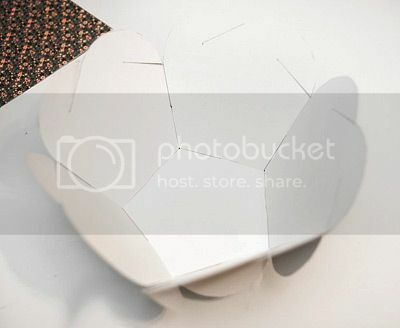 Wrap wire twice to create the double circle that the card or photo slips into. Bend wire at base of circle with your fingers as shown in photo . Now it is ready to be inserted into the cube. Melt your candle wax or UTEE per instructions, carefully pour into silicone square cubes and let harden. UTEE sets up pretty quickly (just a couple of minutes), wax takes 15-20 minutes. For this reason, if using UTEE, pour only 2-3 cubes at a time and insert the wire while base is still in tray. You could also let it harden all the way, then pop it out and drill a hole in the center for you wire. I prefer the in tray option (sorry no photo) since UTEE acts as a strong adhesive and will secure the wire without glue if placed before hardening. Just make sure the wire doesn’t shift. You may have to hold it in place for 1 minute. If drilling, dip tip of wire in adhesive before inserting into drilled hole. If using wax insert wire when wax is almost completely set. This will be about 20 minutes. Just insert the wire and make sure the wax is hard enough to hold it up. Let harden fully, then remove your ready to embellish stand. The idea for these stands came to me when thinking of our Thanksgiving table. I wanted everyone to have leaves to write gratitude/blessings on, to add to a “thankful tree” centerpiece I threw together. To make the tree: I grabbed a mason jar I had painted red, removed the ornaments from my Halloween paper ornament tree and put the tree in a hole I cut in the jar lid, added some stones to hold the tree in place, and topped it off with a fall bow. Thanksgiving Placeholders; I embellished my stands with leaves I die cut from paint swatches with my Sizzix. I hole punched them at the base and tied them to the wire with leftover hemp cord from a prior project. For the name cards, I stamped cardstock circles with monogram letters and mounted them on scalloped circles. For Christmas placeholders, I attached a foil poinsettia (tutorial here) to the base, and a shiny silver bow. I used the interference blue UTEE to create the cube because it looks like snow. UPDATE 12/20: GIVEAWAY WINNER is Debi Beard! Saved By Love Creations has teamed up with BurlapFabric.com to bring you a chance to win $25 in store credit. You can spend this however you want at BurlapFabric.com. To enter, go check out the store, and leave a comment saying what you would buy with your store credit. Winner will be drawn Wednesday Dec. 19th. at 8pm EST. Entries accepted until then. Watch the video below to learn how to make beautiful burlap roses. Visit BurlapFabric.Com on Youtube for more great videos! Irina from Irina’s Cute Box is back today to share another great project. Paper ornaments like this are so fun to make and super inexpensive. I love the festivity and uniqueness they bring to holiday decor. Irina made hers large, for a table accent instead of Christmas tree ornament size. 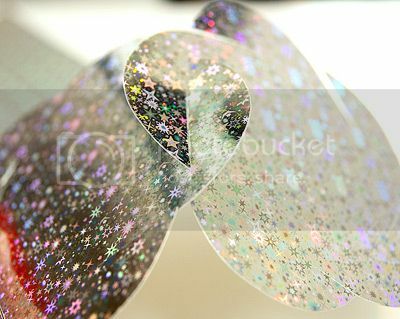 The silver holographic paper she chose is just my kind of glitzy, sparkly awesomeness. Hello SBLC readers! I am excited to share this paper ball ornaments from my childhood with you today. It was a fun project in kindergarten when we made them out of old post cards. 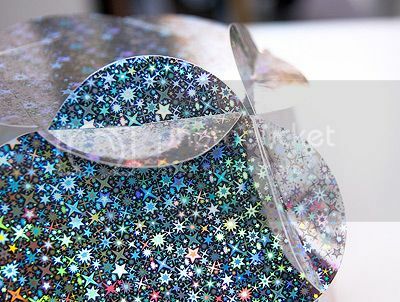 I don’t have any post cards to recycle, so I simply got in Michaels scrapbooking heavy paper with holographic finish. This ball actually not a Christmas tree ornament, unless you have a really tall Christmas tree. I simply used it as a home decoration. First, you need flower templates. You can download them there in JPG file. 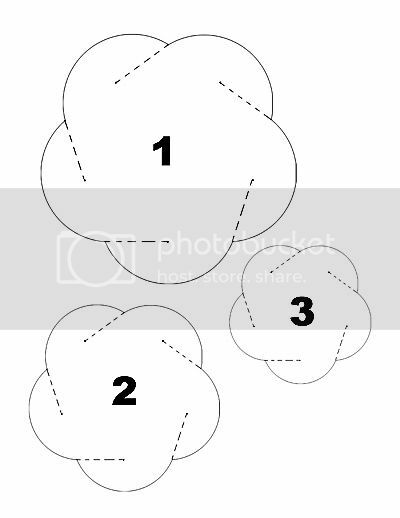 Print the page and cut off one or all flowers. This particular home decoration ball was made using template 1 (the big one). You’ll need 12 flowers. Make slots along the dashed lines. 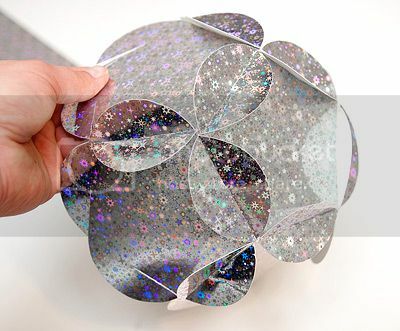 Use the slits to join flower petals together. Keep adding more flowers. So all petals will be connected tho the neighbors. Keep adding flowers until the ornament will be a ball shaped. And… your Christmas home decoration is ready! Place it on a table or book shelf… or any other place. Add a garland or other decorations.